The native form of this personal name is Park Chan-ho. This article uses Western name order when mentioning individuals. Chan Ho Park ((Hangul: 박찬호; Hanja: 朴贊浩; Korean pronunciation: [pɐk̚.tɕʰɐn.ɦo]; born June 30, 1973) is a South Korean former professional baseball pitcher. He played for the Los Angeles Dodgers, Texas Rangers, San Diego Padres, New York Mets, Philadelphia Phillies, New York Yankees, and Pittsburgh Pirates of Major League Baseball (MLB), the Orix Buffaloes of Nippon Professional Baseball (NPB), and the Hanwha Eagles of the KBO League. Park was the first South Korea-born player in MLB history. He has the most career wins (124), of any Asia-born pitcher in history, having passed Hideo Nomo for that distinction, in 2010. During his playing days, Park stood 6 feet 2 inches (188 cm) tall, weighing 210 pounds (95 kg). Park was a member of the 1992 and 1993 South Korea national baseball team. He posted a 2.76 ERA in helping South Korea earn the silver medal at the Asian Baseball Championship in 1993. He also competed in 1993 Summer Universiade , and led his team to the silver medal. Park had a breakout season in 1997 as he became a full-time starter. He tied for the team lead in victories, while posting a 14–8 record and a 3.38 ERA in 32 appearances, 29 of them starts. In 1998, he was 15–9 with a 3.71 ERA in 34 starts and struck out 191 batters in 220.2 innings. After the season, he led the South Korean national team to the gold medal in the Asian Games, beating Japan in the final match. In 1999, he struggled in the rotation with 13–11 with a 5.23 ERA. On April 23, 1999 he became the only pitcher in the history of baseball to allow two grand slams in the same inning and to the same player, Fernando Tatís of the St. Louis Cardinals. There are two more pitchers in the history of baseball who allowed two grand slams in the same game – Jack Morris, and more recently, Brandon Backe – but to different hitters in different innings. He also walked 100 batters in only 194 innings. On June 5, 1999, Park was involved in an on-field brawl at Dodger Stadium with Anaheim Angels pitcher Tim Belcher. Park attacked Belcher after being tagged out after a bunt play. Park's said that Belcher had tagged him too hard on the just-concluded play and asked him about the incident. According to Park, Belcher replied with racist comments causing Park to kick him. Park was granted free agency after the season and was signed by the Texas Rangers in December of that year to a five-year, $65 million contract, which was one of the largest contracts for a pitcher at that time. However, during his time with the Rangers, he was hampered by injuries and a home stadium that favors hitters. In his first season with the Rangers, Park went 9–8 in 25 starts, with a 5.75 ERA. The following season, he only started seven times due to injuries, going 1–3 with a 7.58 ERA. On February 8, 2007, the Yonhap news agency and New York Daily News reported that Park had signed a one-year, $3 million contract with the New York Mets and would report to the Mets' spring training facility in Port St. Lucie, Florida to compete for a starting rotation spot. The Mets sent him down to Triple-A New Orleans following his poor spring performance. On April 30, 2007, Park was called up from Triple-A New Orleans to start for the injured Orlando Hernández. In that sole game, he gave up 7 earned runs in 4 innings. On May 3, 2007, Park was sent back down to Triple-A New Orleans. He was designated for assignment on June 4, 2007. Park with the Dodgers in 2008. 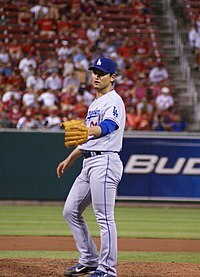 On May 17, 2008, Park made his first start as a Dodger since 2001 against the Los Angeles Angels of Anaheim. He allowed two runs (one earned run) in four innings with no decision. This game turned out to be a historic one as for the first time in MLB history, all three Dodgers pitchers who pitched in this game (Park, Hong-Chih Kuo, and Takashi Saito) were of Asian origin. The Dodgers won it 6–3. On February 28, 2010, Park signed a one-year contract worth $1.2 million with $300,000 incentives with the New York Yankees. Chan Ho Park decided to play for the Yankees after denying an offer of around $3 million per year from the Philadelphia Phillies. Between the 2005 season and the 2006 season, Park represented South Korea in the World Baseball Classic. In the Asia Round games against Taiwan and Japan, Park made appearances as a closing pitcher, shutting out the opposing lineups. 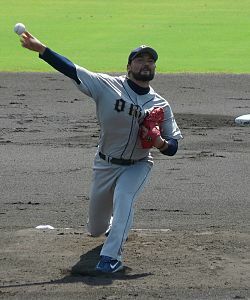 He made another appearance as a closer in the semifinal game against Mexico, in which he again shut out his opposing hitters. His performance made San Diego Padres' manager Bruce Bochy believe that Park can be used as an effective reliever as well as a starter. Park later said that Padres' closer Trevor Hoffman taught him how to focus in a relief situation. With his shutout performance in 10 innings and three saves, Korea finished the World Baseball Classic in third place and Park was selected to the WBC All-Star team along with his teammate Lee Seung-yeop and Team Korea's captain Lee Jong-beom. Park married Korean-Japanese socialite Ri-hye Park on November 29, 2005. Although her heritage is Korean, she grew up in Japan and went to culinary school in New York. She is publicly known as a semi-professional chef, writer and the only daughter of Japan's 76th richest man according to The Philadelphia Inquirer. In spring 2009, Ri-hye released a best-selling cookbook in Korea whose proceeds went to children's charities on behalf of the Chan Ho Park Dream Foundation. Park and his wife have three daughters. Wikimedia Commons has media related to Park Chan-ho. ^ a b "Chan Ho Park". Baseball-Reference.com. Retrieved May 26, 2018. ^ "Players by birthplace: South Korea Baseball Statistics". baseball-reference.com. Sports Reference LLC. Retrieved April 5, 2019. ^ "Players by birthplace: Japan Baseball Statistics". baseball-reference.com. Sports Reference LLC. Retrieved April 5, 2019. ^ 박찬호 발차기는 한국인이기 때문에? (in Korean). Asia Today. January 4, 2009. Retrieved May 29, 2014. ^ "English.YonhapNews.co.kr". Archived from the original on February 12, 2007. Retrieved February 9, 2007. ^ "NYDailyNews.com". Archived from the original on February 11, 2007. Retrieved February 9, 2007. ^ "Ultimate Mets Database – Chan Ho Park". Ultimatemets.com. Retrieved August 22, 2010. ^ "Inside the Dodgers". Archived from the original on April 7, 2008. Retrieved April 3, 2008. ^ Mike Scarr, Dodgers Even Series MLB.com May 18, 2008. ^ Ken Gurnick, No Win for Park MLB.com June 21, 2008. ^ Zolecki, Todd (March 31, 2009). "Park overjoyed to be Phils' No. 5 starter". Philadelphia Phillies. MLB. Retrieved April 3, 2009. ^ Ho-park-sues-chad-kr_n_403422.html "Chan Ho Park Sues Chad Kreuter" The Huffington Post. Retrieved December 25, 2009. ^ Murphy, David (February 22, 2010). "Chan Ho Park signs with Yankees". philly.com. Retrieved July 31, 2011. ^ "Chan Ho Park Stats, News, Photos – Pittsburgh Pirates". ESPN. June 30, 1973. Retrieved August 22, 2010. ^ "Pirates claim Resop, Park off waivers". Seattlepi.com. August 4, 2010. Retrieved August 22, 2010. ^ "Pirates Shuffle Roster on Busy Day". mlb.com. November 3, 2010. Retrieved November 3, 2010. ^ Dan Gutman (1996). The Way Baseball Works. Simon & Schuster. p. 40. ISBN 978-0684816067.